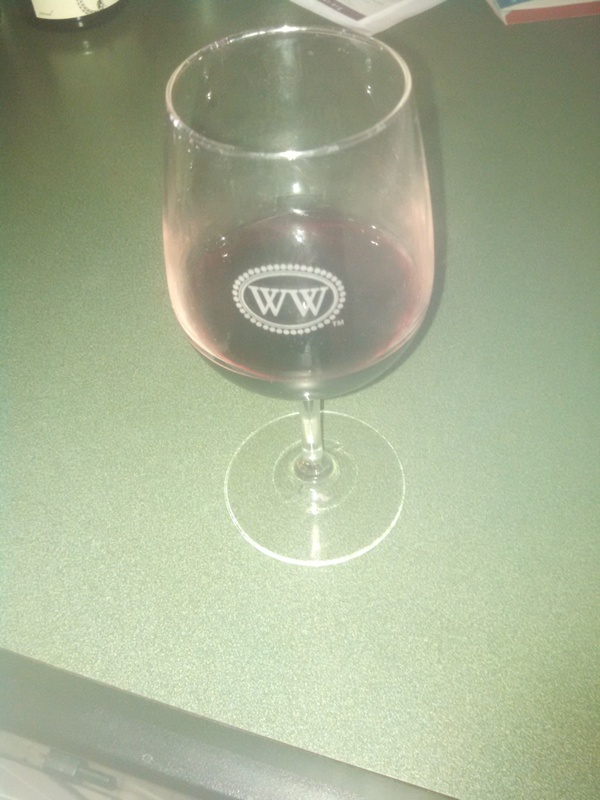 I had the great fortune of visiting The Williamsburg Winery in April of this year. The winery, in addition to the town feels very homey and Christmasy. The town has a great energy that feels authentic. It’s a town I would say I wish I was from or grew up nearby. There is a strong sense of community and togetherness that happens, not just during the holidays, but all year round. A template of Williamsburg; with its shops, restaurants, and year round festivals is the perfect blueprint for what all wonderful places are like. I wish I had taken photos of my visit here. But the charm level is in full effect. 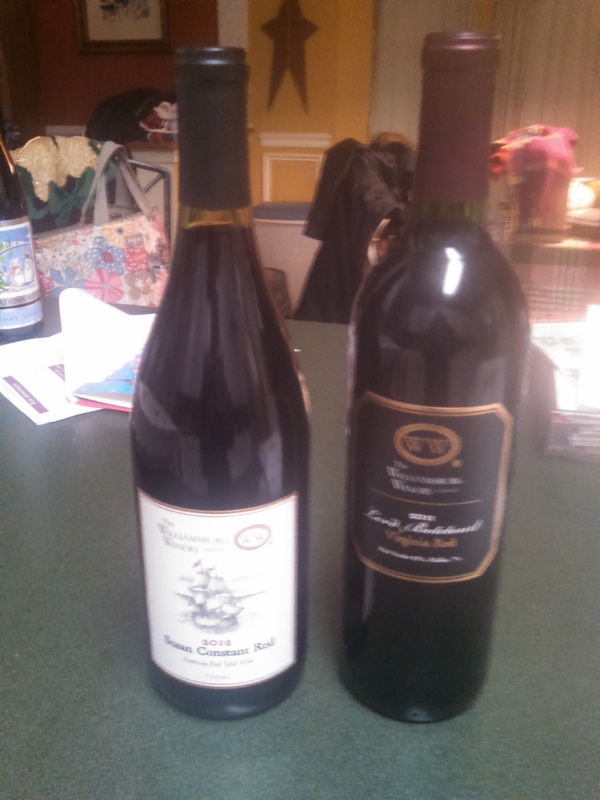 The two wines I purchased were the 2012 Susan Constant Red, which is a Sangiovese and the 2011 Lord Botetourt Red, which is a 7% Malbec and 93% Petit Verdot. The latter is a new one for me. I gladly tasted both before purchase. The Sangiovese is a simple everyday wine. I drank it rather quickly compared to other Sangiovese’s I’ve had, or other lighter reds in general. The synopsis reads that cherries and raspberries can be detected. I tasted some berry or fruit flavors but wouldn’t be able to say that they were those berries for sure. I did not discover the hints of cloves or tobacco. The suggested pairings were with grilled meats; such as lamb, ham or tuna. I enjoyed it with a cheese and three cheese white pizza slice respectively. I thought the duo tasted stupendously. The Lord Botetourt tastes like all of my favorite wines. The label reads that there is a nice straw/grass character to the bottle. This is new to me and I am excited for that. There mentions some red fruits and a hint of green apple. I’ll see if I can detect that next time. This is an incredible wine that deserves to be paired for celebratory occasions. I drank this back in the late spring so a cold weather experience may give it a different taste. So I will enjoy soon. Christmas Eve dinner may sound about right. I intend to make a return to Williamsburg in the near future. A place with this much character, deserves a larger recap and plenty of photos. What is most important, in the end, is to drink what makes you feel good. If there is a wine and food pairing you want to try, then go for it. Of course, certain bottles shall be reserved for special occasions. But that special occasion is whatever you want it to be. In the spirit of Christmas and the holidays, it’s even more of an incentive to have something that brings you joy. This is what this time of year is all about. That’s what this life is all about. Have something that makes you feel inspired.